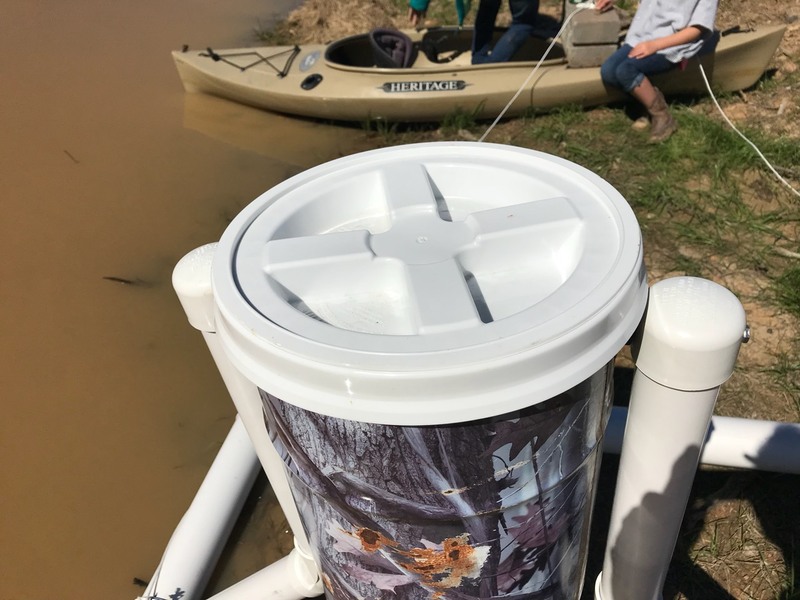 Thought I would post some pics of my homemade floating feeder. This is made with 4" thin wall pvc to reduce weight. The feeder supports are 2". After reading bad reviews on the lower cost directional feeders, and being too cheap to buy a nicer model, I came up with this design. The bucket is a repurposed metal 6.5 gallon feeder I had around. It is fastened to the uprights using 1/4 inch bolts through the handle supports. The lid is a "Gamma" lid from Lowes that unscrews for easy access. It looks to hold about 25 lb of feed. I used online calculators to find the buoyancy based on the volume of the pvc, which was approx 55 lbs for the 4 inch pipe. 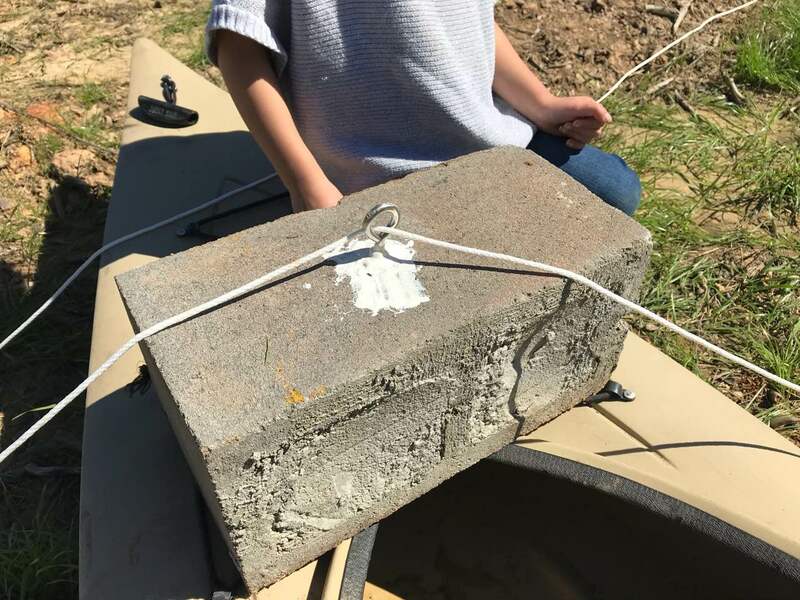 The concrete block is the anchor point with a rope loop that allows me to pull it on shore for maintenance. I also found a $10 wireless 6volt switch on amazon and wired it in so i can manually feed at the press of a button. Very creative. Still getting a 1/2" of ice on our pond every morning still. We had a week of temps in the 80's but now we are back to morning frost. Trying to get the feeding system worked out before spring fully arrives. This is a great idea! Nice work! Creative design. Thanks for sharing your idea and project. Others should find this helpful. Please return to keep us updated as to the durability and life span of the feeder mechanism. What brand of mechanical spreader did you use on the bottom of your bucket? Can you elaborate more about how you wired the "$10 wireless 6volt switch on amazon and wired it in so i can manually feed at the press of a button". Will definitely keep you guys updated. I am using the Wildgame Innovations feeder. I basically bought what they had on the shelf at walmart but it turned out to be ideal for this setup. For one, the control unit can be easily disconnected from the motor(terminals instead of solder). Second, the controller allows lo/med/hi rpm adjustments. This allows more flexibility for throw radius and presumably the volume of feed thrown as well. My main concern as compared to past moultrie feeders i have owned is the metal case. I may eventually end up with rust being so close to the water. For the remote feeding add on, its basically a 6v relay that has a 433mhz wireless controller. Its similar to a vehicle remote entry system. I just wired it direct from battery to the motor to bypass the original timed controller. Most feeder companies offer these addons but they want $30 or more for it. Links for the two products I used below. Soooooo....I appear to be off to a bad start. I went out to check on the feeder yesterday and to see how the pond was doing after around 1 inch of rain. As I approached the pond I noticed some feed that had obviously been wind blown to the far side of the pond from the feeder. Closer inspection and the downwind side of the pond edge was COVERED in Aquamax 600. I felt my stomach sink as I realized most of the 20 to 25 lbs of feed I put in the feeder on Saturday was sitting at the edge of the pond. 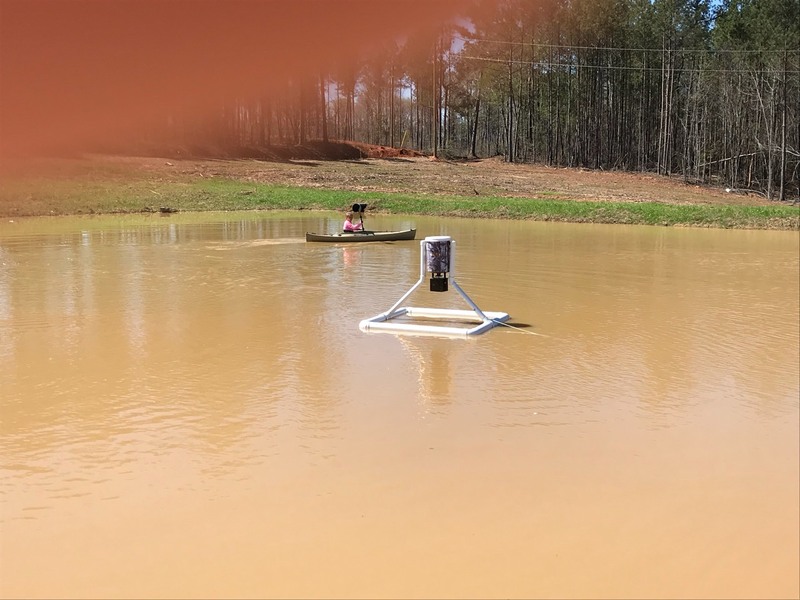 I pulled the feeder to shore for inspection, and could see from the feed dust covering the feeder that SOMETHING had obviously triggered it to run for a long time. The battery was reporting mostly drained as well and had apparently been drained enough to reset the clock on the timer unit. So about 20 lbs(and $20 dollars) of feed as been wasted. My theory is that SOMETHING triggered the 433mhz wireless switch to activate. It was set to the default where "button A" turns it on and "button b" turns it off, so if some sort of wireless interference cut it on, the likelihood is low that another signal would come to send the "off" command. I tried to reproduce the problem last night but the timer going off doesn't seem to cause it. I've since reprogramme the wireless switch so that "button A" is a momentary switch. I think that will be safer. I'm going to redeploy with only 4 or 5 lbs of feed and see how it does. Will keep you guys updated! I was wondering if you could put a solar panel on it to keep the battery charged like you would on a deer feeder? Yes that would be easy to add, although most of my deer feeders run for 8+ months on the same battery so it hasn't been my top priority. I think the reason the battery was so drained was because the motor ran for a long time. I believe I would call the company and ask questions. I have used deer feeders for a LONG time, lots of different types and models, and never seen that happen. My theory is that SOMETHING triggered the 433mhz wireless switch to activate. Have you noticed the feeder going off at exactly the same time the garage door opens? Well the pond is in a pretty remote location. The closest house is probably 2000 feet away. There is a road nearby with very light traffic. I tried pressing my vehicle remote entry system buttons but that didn't trigger it. I live near a US airforce base and have heard of a few stories that suggest that some aircraft can trigger remote control items. In one case, the person installed an electronic signal filtering device that kept the false triggers from occurring again. He was a controls engineer, but it did take him a while and some sanity to put two and two together before realizing it was the B2 bomber causing the doorbell to ring and his garage door to open. Just imagine... Everytime someone ding-dong-ditches your front door and you go to the door, you find that you left the garage door up again. Hmmm, we don't have alot of air traffic but that does show that outside interference is a real possibility. At least I don't have a security issue...although it felt like I had been robbed to see $20 worth of AM 600 going to waste! I checked with the closest neighbor and he doesn't have a garage door opener. I reprogrammed the relay so that its only switched ON while its receiving the signal vs. needing a second signal to switch OFF. 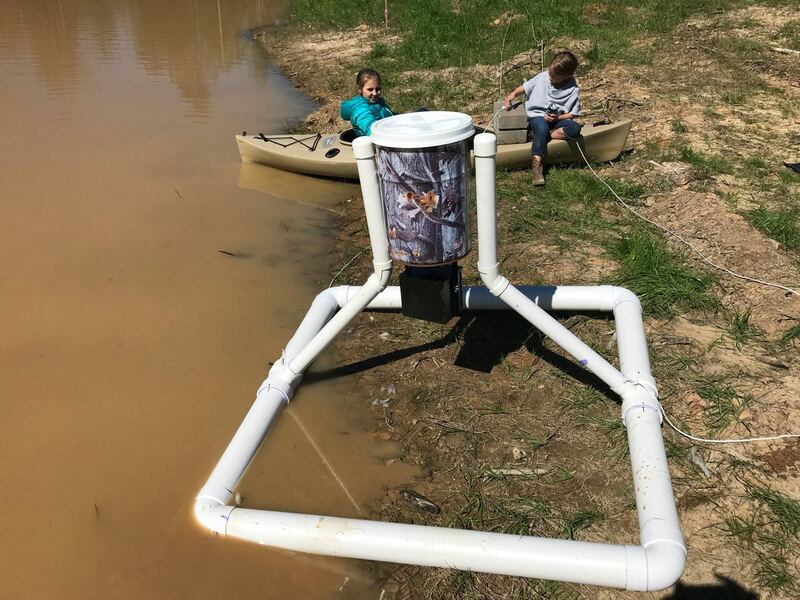 We've had rain the last 24 hours but once it clears I'm going to set it up on the side of the pond with another bucket over the feeder to catch the feed and see how it performs for 4 or 5 days. Just wanted to update this thread. I managed to get the kinks worked out on this feeder. I haven't had anymore false triggers on the wireless mechanism, so reprogramming it to be a momentary switch vs On/Off seems to have done the trick. I also added a solar panel to the mix which seems to be keeping the battery charged. The only problem I've had is that water was infiltrating the lid and ruined a couple of cups of food. Turns out you need to really torque the lid down to ensure a tight seal on the rubber gasket. I also don't like that the lid is recessed and holds rainwater. It doesn't cause any problems, just annoying when adding feed. Overall I'm really pleased with the design. Alot of the feed falls within the floats and sort of acts like a feed ring. You maybe could make a small waterproof canvas or tarp type slip cover for the top of it. That would give you some added protection against water collecting on the lid and seeping past the lid seal. Another option to solve rain water leakage would be to attach a fairly large lid to the top of the feeder so the lid sheds water. Two things I would consider to use would be a garbage can lid (plastic or metal) or an upside down round snow saucer. Just attach the lid with a few screws or maybe put a piece of wood on top of the lid and screw the lid to the wood. With the lid in place you would not have to tightly torque the top to the feeder. I wound up ditching the "fancy" screw-on lid for the cheap snap-on type and it works great. I'm filling the feeder once a week without issue. It does still collect some water on top, but not nearly as much. Knock-on-wood, I don't have any critters smart enough to pop the top off.